The playoff era is upon us. And like the playoff committee, ESPN assembled its own 13-member committee to come up with its Top 25 Power Rankings. Football Power Index predicts and ranks team strength based on expected points added from offense, defense and special teams, adjusted for opponent strength. Using preseason FPI, ESPN Stats & Information has projected each team's chances of winning each game on its schedule based on the difference between the two teams' FPIs, game site and game type. We are gathered here today to witness the holy union of the playoffs and major college football. Our Top 25 is packed with insights from ESPN Insiders Phil Steele, Travis Haney and Brock Huard, plus two (that's right, two!) sets of rankings. We assembled a 13-expert panel to lay out a Top 25, then lined it up against some serious algorithms (see FPI). So for better or worse, we introduce for the first time -- the Playoff Era! On a late afternoon in early July, after local dignitaries had sung his praises, Jameis Winston addressed 500 family members, friends and fans at the high school stadium where he became a Hueytown, Alabama, legend. The crowd was clad in garnet and gold to honor all he'd done in his one season at FSU. Confidence, Winston told them, was the key to his success. "I've got this perception about me that Jameis is cocky, overconfident," he said. "If you hold yourself to a certain standard, people are going to talk. But that's you being yourself, and this is a blessing." His confidence transformed a team mired in mediocrity, but it's a double-edged swagger. Heading into the spring, he was already under intense scrutiny, even after being cleared in the inquiry into an alleged sexual assault. From stolen crab legs to Jameis Winston Day in Bama country, this offseason has had no more divisive storyline or bigger character. For his encore to end with a second title, or a second Heisman, or even a reclaimed image, Winston must show, not just tell, that the perception isn't reality. FSU returns 13 starters from a BCS title team that outscored opponents by an average of 52-12. One of the starters back, of course, is Winston, who had a positive TD-to-INT ratio in every game except the 41-14 win over Miami. The weakest unit according to my positional rankings is the RB corps, which I still have No. 12. In other words, the Noles are the most talented team on paper and have a favorable schedule -- their three toughest games (Clemson, Notre Dame and Florida) are all at home. FSU has been favored in 37 straight games, and I have them by double digits in every one this year. PLUS Talent. Jimbo Fisher has signed a top-10 class every year since he took over in 2010, and coaches say the Noles have draft picks at every spot. The 13 returning starters also have learned how to win the NC State-type games that derailed past title runs. MINUS "Johnny Manziel disease." Is Winston cured? No one knows. FSU coaches think next-gen Noles Jalen Ramsey (a top-five FS) and DE Mario Edwards will emerge as leaders. 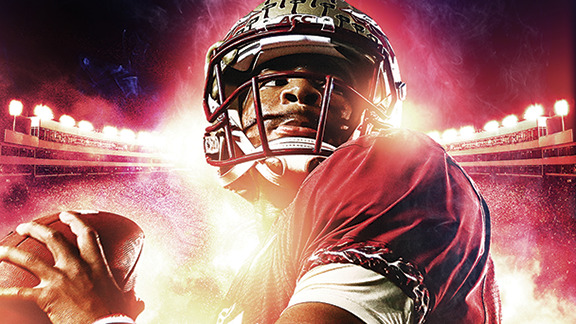 But the Noles go as Winston goes, and that makes this the most intriguing preseason No. 1 in a long time. Florida State's chances vs. its toughest foes. The computers must have been blinded by last year's blowout in Death Valley. This is Dabo Swinney's best front seven (whole D-line returns) by a long way. No denying the Noles are the favorite, but a little over a 10 percent chance for the Tigers is too low. Is the Tide finally receding? There was an inescapable feeling watching Jacob Coker in a private workout this spring. He was a model QB: 6-foot-5, 230 pounds, athletic with arm strength and full of moxie. But there was still this nagging sense that he shouldn't even have been in Mobile. Maybe it was the pouring rain. Or the way his crimson shirt clashed with his scarlet-and-gold cleats. Or the simple understanding that he'll always be linked to FSU -- the job he lost to Jameis Winston, the Noles apparel still in his closet, his shiny BCS title ring. But Coker, who threw only 41 times in his three years at FSU, could just as easily be a lemon as the leader of Alabama's next juggernaut. Either way, Nick Saban is all-in on the former three-star prep. This isn't a move of choice but of desperation. If it fails, the blame goes to Saban and staff. After three straight No. 1 recruiting classes, you'd think there'd be a decent arm on the roster. But if Coker hadn't transferred, the Tide simply wouldn't be in the playoff mix. Saban needs Coker to be as advertised. If not, Bama will be an outsider looking in at the new playoff. Bama has won three national titles under Saban, two of them with first-year starting QBs. Coker gets the benefit of my No. 1 set of RBs, my No. 2 WR unit and my No. 8 line. And each of Bama's defensive units is top-10. As for the schedule, it could be bumpy. The Tide have been favored in 54 straight games coming into '14, which is tied with FSU (1997-2001) for the longest streak in the past 20 years. I have Bama favored in every game, but three are by only single digits (at Ole Miss, at LSU and Auburn), with the trip to Baton Rouge being the shortest odds at minus-3. PLUS The Saban Way. Bama won three of the past five BCS titles, without a Tebow or a Johnny or a Jameis. Coker doesn't even have to be a Greg McElroy -- that's how much rival coaches believe in Saban's ability to develop at every other position. MINUS The hurry-up offense. Bama's D could not slow down A&M, Auburn or OU. So Saban turned to Baylor's Art Briles for tips on how to run it, likely in order to stop it. We'll see what he learned. Alabama's chances vs. its toughest foes. I know Baton Rouge is a brutal road environment, and this game has typically been close. But the bright lights could very well backfire on LSU's hyped freshmen against a dominant Bama D. I think this should be closer to an 80 percent lock than a toss-up. The Sooners brand had gone stale. The defense, which used to freight-train opponents, was getting lit up. The offense lived in the pocket-passing stone age. Even recurring BCS bowl berths were old hat. "People get bored with just winning the Big 12," Bob Stoops said. To revive OU, Stoops reinvented it. In 2012, he tapped younger brother Mike to fix the D, then fired three line coaches in February 2013. 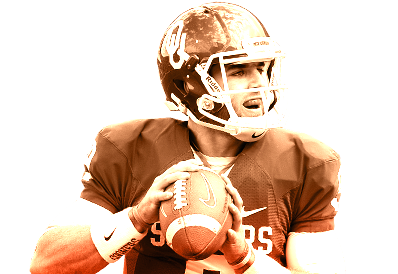 Six months later, he started the QB carousel, ditching presumed starter Blake Bell for dual threat Trevor Knight. Stoops' gambles have worked, to a degree. OU led the Big 12 in total D (350.2 YPG), but then again, the Sooners gave up 516 yards in a 45-31 win over Alabama in the Sugar Bowl. Knight threw for 348 yards (or 42 percent of his season total) vs. Bama but must prove he's no one-game wonder. So this fall will be a litmus test. After just five career starts, Knight is the man now that Bell has moved to tight end. And the D, loaded with quick pass-rushers, has the makings of one of the Big 12's top front sevens. "We've changed the whole vibe of Oklahoma football," Mike Stoops says. While analysts and Vegas experts can overreact to bowl wins, OU does have 14 returning starters and my No. 12 offense, No. 8 D and No. 9 special teams. The Sooners also have the path of least resistance among the top four contenders. They're 57-4 at home the past decade, and in their five true road games this season, they take on just one team (Texas Tech) that had a winning record last year. Plus, they don't have to play a Big 12 title game, and they get the revenge game against Baylor at home. I have OU favored in all 12, but four are by a TD or less, including at TCU (minus-3). PLUS Defense. If the O can keep moving the ball with Knight, Texas and Baylor don't scare me. That's because the D, which used to pull up OU's reins, boasts big-play potential, especially from LBs Frank Shannon and Eric Striker. And there isn't a better DC in the Big 12 than Mike Stoops. MINUS High expectations. Last year's bowl win was sweet, but it brought on an inflated perception that could take until the national semis to deflate. About half of Knight's completions and TDs came in that one win. So what did the QB do in the other four games to earn him Sam Bradford-like hype? Oklahoma's chances vs. its toughest foes. Mike Stoops says this is one of the best D's he's had in Norman. Against a one-dimensional Tech team, I think OU should be a much heavier favorite. The start of a tailspin? Oregon used to own Stanford. Ask Andrew Luck. But that's all changed the past two seasons, with the Cardinal spoiling the Ducks' national title hunt -- twice. Oregon is quick to blame Marcus Mariota's knee injury for its 2013 loss, but public perception is the bottom line. Once is a fluke. Twice? Coincidence. Three times is habit. Losing to Stanford is one trend coach Mark Helfrich must end in 2014. If not, Eugene could cloud over with another year of unmet expectations. If that sounds unlikely for a team that went 11-2 last year, consider the evidence. The season after Chip Kelly bolted, Oregon failed to reach a BCS bowl for the first time in five years. And there have been other fissures under Helfrich: the white-flag effort at Arizona; budding star WR Bralon Addison blew out his knee this spring; and since March, nine players have been either dismissed due to behavior issues or left in search of playing time. That's not to say Oregon has come unhinged, not with Mariota and 17 upperclassmen in the starting lineup, but Helfrich knows he must tighten the screws. He can't resurrect Kelly's "win the day" culture -- and make it his own -- without a win over Stanford. I rank Oregon's offense No. 2 overall, and Mariota is my preseason Heisman pick. The Ducks also have my No. 3 set of RBs and No. 1 O-line. 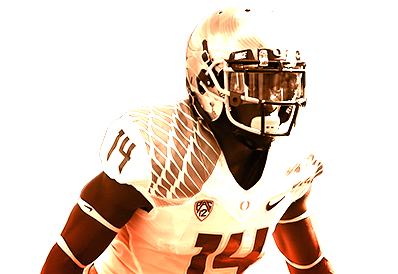 Although D-coordinator Nick Aliotti retired, Don Pellum has been on staff since '93 and gets back the country's best cornerback, Ifo Ekpre-Olomu. The Ducks get Michigan State at home, where they're 33-2 since 2009. In fact, Oregon enters 2014 having been favored in 30 straight games, and I see the Ducks as double-digit favorites in all but three this year -- but one of those is as a three-point 'dog at UCLA. PLUS Depth. Ten seniors will start, and the Pac-12 doesn't often see twin-tower DLs like juniors DeForest Buckner (6-foot-7) and Arik Armstead (6-8). MINUS Perception. The losses to Stanford offer a blueprint that opposing coaches will use to try to neutralize Oregon's flashy style and speed. Helfrich and his staff need a playoff berth to change that blueprint. Oregon's chances vs. its toughest foes. You lose to a team two years straight and lose six starters on D, yet you are a 78-percent favorite? The Cardinal will likely be the dog, but it'll find a way to slow this game down and keep it physical -- and much closer to 50/50. Thirteen seconds. That's how long it takes to put on a tie or send a text message. For Auburn, it was the difference between winning and losing a national championship. There were only 13 seconds left when Jameis Winston found Kelvin Benjamin in the end zone for the go-ahead touchdown, propelling Florida State past Auburn in the BCS National Championship Game. Had the Tigers held on for 13 more seconds, we would've been talking about the greatest turnaround in college football history and the school's second title in four years. Instead, it will be remembered as the magical season that came up just short. Now, as Gus Malzahn heads into his second season as Auburn's head coach, the culture around the program has changed. The Tigers are no longer sneaking up on anybody. The target will be placed squarely on their back this season, and that's exactly where Malzahn wants it. They have seven starters returning on offense, seven on defense, and those 13 seconds will be what keeps this team motivated and hungry to get back. Their goal isn't just to make college football's first playoff. Their goal is to win it. 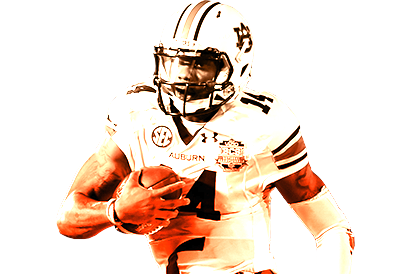 With all of Gus Malzahn's success as a coordinator and coach, it's hard to believe Nick Marshall is his first two-year starter at QB in college. Marshall will have the luxury of playing behind my No. 2 O-line, and I would actually favor this team by four points over last year's BCS runner-up. The biggest question is whether the Tigers can navigate a schedule that I rank as the fifth toughest in the country. I have them pegged as underdogs in two games (at Georgia and at Bama) and a TD-or-less favorite in five others. At least SOS won't be an issue. PLUS Offense. You can roll your eyes at the Tigers' luck, but you can't ignore 328 rushing yards a game -- 20 more than any other Power Five team. Marshall will be a better passer in Year 2, with prime targets: Top WR Sammie Coates (902 yards) is back, and juco transfer D'haquille Williams is getting rave reviews. MINUS Defense. Being decent got them to the title game, but big plays are a major concern -- 76 of 20-plus yards in '13, most in the SEC. Auburn's chances vs. its toughest foes. UGA's thin secondary will be even thinner after four straight games away from Athens. If Auburn's offense is healthy, no way this is decided by a toss-up again. The banner with the motto in big, bold letters is still hanging in the practice facility, a daily reminder that it wasn't able to accomplish its goals a year ago. "The Chase" is still on for the Buckeyes. Despite cruising through a second consecutive unbeaten regular season, Urban Meyer's team followed up a 24-game winning streak with back-to-back losses in the Big Ten championship game and Orange Bowl, leaving a bitter taste in the mouths of the Buckeyes and a mission that remains unfinished. "We didn't accomplish it last year, so we're still chasing, still trying to finish the chase," defensive tackle Michael Bennett said. "I think it's good that they didn't just change it up for the sake of changing it up. If anything, I think guys feel it more now, that motto hits us closer to home now." The Buckeyes certainly came close to needing a new mantra a year ago, but a horrendous pass defense ultimately proved their undoing as the season came to a close. New co-defensive coordinator Chris Ash was hired to patch up those problems, and if he can help provide a complement to Ohio State's explosive offense with quarterback Braxton Miller back for one more season, the program might be able to hang a different kind of banner. Urban Meyer has yet to lose a regular-season game at Ohio State, and the Buckeyes are in prime position to extend that streak with 12 starters returning, including Heisman hopeful QB Braxton Miller. They also return my No. 1 defensive line, led by my preseason All-Americans Michael Bennett and Joey Bosa. The schedule sets up nicely too -- they avoid the top four teams out of the newly named West (Iowa, Nebraska, Northwestern and Wisconsin), and I have them favored in all but the road trip to East Lansing, which I see as a toss-up. PLUS Meyer's ego. He may have won 24 straight, but all anyone remembers are his last two losses. The bar's been set high, which is why I think OSU wins the playoff. That and Miller, my Heisman pick, who is better than any other QB (Jameis Winston included) at creating something out of nothing. MINUS A young OL. Only 21 career starts return (third fewest in the FBS). I trust Miller to find space but not the RB-by-committee. Ohio State's chances vs. its toughest foes. No way OSU has this big an edge in the league's top game. The Bucks should be 8-0, but MSU will be home off a bye with a D hitting its stride. Head coach Mark Dantonio described Michigan State's brilliant, Rose Bowl-winning 2013 season as "completion." But he and his Spartans are far from finished. After climbing all the way to No. 3 in the final polls last season, they see their next step as reaching the College Football Playoff and cementing their newly elite status. They'll get a chance to do that early on with a Week 2 showdown at Oregon before doing battle with Ohio State in the Big Ten's new East Division. One of the nation's top defenses over the past few years will have to replace veteran stars like Thorpe Award winner Darqueze Dennard and linebackers Denicos Allen and Max Bullough. But loads of holdover and fresh talent are in place, including reigning Big Ten defensive lineman of the year Shilique Calhoun. Defensive coordinator Pat Narduzzi decided to stay in East Lansing after winning the Broyles Award as the nation's top assistant. The offense returns almost everybody, led by quarterback Connor Cook, who was the surprise MVP of both the Big Ten title game and the Rose Bowl win over Stanford. The focus this offseason was about avoiding complacency. It's possible that these Spartans are just getting started. Michigan State returns seven starters on offense, led by QB Connor Cook and RB Jeremy Langford, while the defense must replace six starters, including three All-Americans. 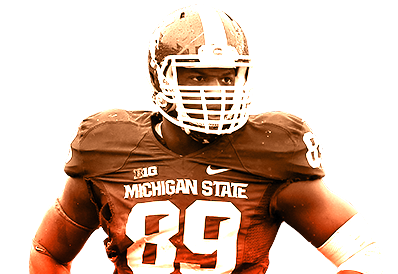 But D-end Shilique Calhoun, who's on my preseason All-America list, returns and, most important, so does defensive coordinator Pat Narduzzi. If this were last year's schedule, I'd say the Spartans have a clear path to the playoff. Instead, Notre Dame (MSU's only loss in '13) is replaced by a trip to Oregon, where I have Sparty as a two-TD underdog. But Michigan, Ohio State and Nebraska are at home, and I have MSU favored in every game except OSU (toss-up). PLUS Narduzzi didn't take a head job. Even with half its tackles gone from '13, the Spartans' D will reload. It reminds me of FSU in terms of depth. Pretty amazing that I can make that comparison, considering how different the recruiting landscape is for MSU. Narduzzi, second to none in developing talent, is the reason I can. MINUS Added pressure on Cook. Last fall the junior (22 TDs/6 INTs) was a pleasant surprise. But now he's the guy, and leading the defending Big Ten champs won't be as easy with a target on his back, especially behind an O-line that lost three starters. Michigan State's chances vs. its toughest foes. A 1-in-10 shot? The metrics must've missed Oregon's struggles against the closest MSU competition. Stanford had nearly 300 yards rushing in last year's win. Did I mention that MSU uses the same power-run scheme? Heading into its third season under coach Jim Mora, UCLA has gone from perennial underachiever to dark horse national title contender. The Bruins have fallen short of high expectations before, but this squad feels different. While this team has plenty of speed and flash, best realized with an up-tempo offense, this crew also has plenty of grit on the line of scrimmage on both sides of the ball. From a preseason perspective, there doesn't appear to be an obvious weakness or big question, though Mora is counting on some young players who flashed potential in 2013 to grow up this fall. They are led by QB Brett Hundley, a leading Heisman Trophy candidate, who surprised some folks when he opted to return instead of entering the NFL draft. On defense, they have talent at all three levels, though replacing the production of outside linebacker and NFL first-round pick Anthony Barr won't be easy. The LBs are led by sophomore Myles Jack, who again is expected to play both ways while getting carries at running back. The defensive line could end up the best unit in the Pac-12. Mora turned down overtures in the offseason from Texas and Washington. Why? Because he thinks he's building a national program in Westwood. UCLA's 17 returning starters is the most in ESPN's Top 25 -- the Bruins get back their top four rushers, five of their top six receivers and 10 of their top 14 tacklers, including the entire secondary, which I rank sixth. Not to mention that Brett Hundley is one of the most experienced and talented QBs in the country. I have the Bruins favored in every game; they get Oregon, Stanford and USC at home. But I have them as a TD-or-less favorite in six games and only a field goal favorite against Texas (at AT&T Stadium), at Washington and against Oregon. PLUS Hundley. I think he could've gone No. 1 overall in the 2014 draft. He has the mindset to go with the skill set and will have more weapons to work with than any other QB with a legit playoff shot. MINUS Sacks. Returning four starters to the O-line is usually a plus, but UCLA has allowed 88 sacks the past two seasons. In last year's Stanford loss, Hundley was hurried nine times and sacked four. Poise and talent can't overcome that. UCLA's chances vs. its toughest foes. ASU returns just two starters on D and has five fresh faces on O. A 50-50 chance isn't giving the battle-tested Bruins their due. Gone are the No. 1 overall pick in this year's NFL draft and the player Steve Spurrier called the greatest quarterback in South Carolina history. Jadeveon Clowney and Connor Shaw both left indelible marks on the Gamecocks' program, but it's also a program that's in the midst of an unprecedented run, a run that nobody in Columbia, South Carolina, sees ending any time soon. Spurrier, pushing 70 and seemingly getting younger all the time, has engineered three straight 11-win seasons. South Carolina has finished in the top 10 in the Associated Press poll each of those three seasons, one of three schools nationally along with Alabama and Oregon that can make that claim. Extending that streak to four straight years won't be easy, especially with so many question marks in the defensive secondary. But the Gamecocks return what should be one of the best offensive lines in the country, a fifth-year senior quarterback in Dylan Thompson who's been money in relief, a 1,000-yard rusher in Mike Davis and a roster full of fresh faces eager to keep the Gamecocks among college football's elite. Spurrier has already accomplished more at South Carolina than anybody thought possible. Now, if he can only bring the Gamecocks their first SEC championship. South Carolina, Alabama and Oregon are the only teams to finish in the (AP top 10 in each of the past three years. And the Gamecocks appear poised for a fourth straight, despite the losses of QB Connor Shaw and Jadeveon Clowney. They welcome back 85 percent of lettermen, the highest mark in the FBS, and I think they'll have a better rush defense and more sacks than in 2013, even without Clowney -- the front seven returns four starters, and last year's numbers were the lowest since 2007. While USC hosts Georgia, I have Steve Spurrier's squad as a TD-or-less 'dog at Auburn and at Florida. PLUS Ground game. The O-line returns 113 starts, tied for most in the SEC, and Mike Davis is better than (healthy) Marcus Lattimore. If the RB doesn't finish top three in the SEC, Spurrier should retire his visor. MINUS No more Shaw. The coaches trust Dylan Thompson, so I'm not saying the redshirt senior is a minus. But Shaw got six yards when you needed five. Thompson can't make those plays on the ground, so is he a good enough passer to overcome that? I'm not convinced. South Carolina's chances vs. its toughest foes. Strong RBs and dominant lines tend to rule the SEC. And the Gamecocks will be coming off Kentucky, a bye and Furman. No way Auburn wins easily. The two-time defending Pac-12 champion ended the BCS era as the lone school to qualify for BCS bowls the last four years. As the playoff era begins, Stanford's goal remains the same: win the Pac-12. And although Oregon is the clear favorite in the North Division, the Cardinal's recent success -- overall and against Oregon specifically -- and returning talent is enough to warrant inclusion in the top-10 and Pac-12 title conversation. There's no doubt the program will miss former defensive coordinator Derek Mason, who left for Vanderbilt, and the five defensive starters from last season currently in NFL training camps, but the Cardinal should still be stout defensively. Longtime defensive assistant Lance Anderson takes over for Mason and inherits experience at every level of the defense, including one of the most talented secondaries the team has had in years. Contrary to national perception, quarterback Kevin Hogan improved in 2013 and enters his third year as a starter with one of the conference's top groups of receivers, led by Ty Montgomery and Devon Cajuste. The Cardinal also expect to reintroduce the intermediate passing game -- something that was just about nonexistent last year -- with a trio of talented redshirt freshmen tight ends. Stanford hasn't missed a beat under coach David Shaw, winning two straight Pac-12 crowns. This year the Cardinal return 12 starters, and that list includes QB Kevin Hogan and WR Ty Montgomery, whose kick-return (skills lead my No. 2-ranked special-teams unit. The big question is how the team will fare against my 16th-toughest schedule -- road games against Washington, Notre Dame, Arizona State, Oregon and UCLA. I peg Stanford as an underdog in three (ND, Oregon and UCLA) and see Washington and ASU as toss-ups. PLUS Continuity on defense. Stanford has had the Pac-12's stingiest scoring D three of the past four years. Safety Jordan Richards, CB Alex Carter and DE Henry Anderson are among seven returning starters who will continue the trend. MINUS RBs. You'd have to go pre-Toby Gerhart to find a Stanford team with this big of a void in the backfield. Barry Sanders will likely get the nod, but he's mostly been a screen specialist. Stanford's chances vs. its toughest foes. Losses on the O-line and at RB make this a very different matchup from the previous two against the Ducks. But an 80 percent 'dog? No way Shaw's D lies down. Is there enough D in Waco? Art Briles and his Bears just keep collecting shiny new things, don't they? Last year, they unveiled the gold chrome helmet. They rolled out their bright new quarterback, Bryce Petty. And then they rolled to their first Big 12 championship trophy. Briles even picked up a championship belt -- which he proudly showed off during a magazine shoot -- to commemorate a year and a team Baylor won't soon forget. "We've got the belt around our waist and it's buckled up pretty tight," Briles said this spring. "It'll be a struggle to get that sucker off of us." But there are better, brighter things on Baylor's horizon, starting with pristine new McLane Stadium (price tag: $260 million). The 45,000-seat palace is state-of-the-art in every way, a perfect match for a Baylor offense that should be next-level great in 2014. Petty, now a senior, is a year wiser and sharper, and he gets sparking new toys -- watch out for RB Johnny Jefferson, WR K.D. Cannon and TE Tre'Von Armstead -- to go along with gems like Antwan Goodley and Shock Linwood. What stands in Baylor's way of a golden ticket to the College Football Playoff? The only question marks are on defense, where DC Phil Bennett must find new starters who can play up to the level of last year's game-changing unit. The defending Big 12 champs return only 10 starters, but that group includes QB Bryce Petty, who threw for 4,200 yards and accounted for 46 total TDs. He'll be throwing to my No. 1 set of WRs, including five of the Bears' top seven pass catchers from 2013. I actually rank the entire offensive unit No. 1 in the country, and I have the Bears favored by at least a TD in 10 games. The exceptions are road trips to Texas (toss-up) and Oklahoma (underdogs). But don't forget that they beat UT and OU by a combined score of 71-22 last season. PLUS Art Briles' system. I'm not sure if Petty is even a top-10 QB without the spread-it-out, air raid offshoot that Briles brought to Waco. And given the talent he'll have to work with at WR, it's criminal to have the Bears outside the top 10. MINUS The schedule. And I don't mean its strength. The committee won't love a starting slate of SMU, Northwestern State and Buffalo, so Baylor must run the table to have a shot at the playoff. Briles told me he thought Baylor would have nabbed a playoff spot last season, even with one loss. Sorry, Coach, not in '14. Baylor's chances vs. its toughest foes. BU won two of the past three (but not at OU) and will be off a bye and KU. This de facto Big 12 title game is more like 50-50. Even with record-setting quarterback Aaron Murray gone, the Bulldogs shouldn't have a problem scoring points, as most of an offense that averaged 484.2 yards and nearly 37 points per game in 2013 returns. With a stacked backfield, led by Heisman Trophy candidate Todd Gurley, and a talented, veteran group of receivers, fifth-year senior Hutson Mason should pick up right where Murray left off. The real questions for Georgia come on defense, where new DC Jeremy Pruitt could have his hands full all year. The loss of three starters in the secondary won't make things easier, as the Bulldogs will have to turn to a handful of inexperienced players to fill up a secondary that ranked 95th nationally in yards allowed per pass attempt (7.7). What will help is arguably the nation's best linebacker corps, headed by Ramik Wilson, Jordan Jenkins and possible breakout performer Leonard Floyd, who should be one of the SEC's best pass rushers this fall. The Bulldogs get tested right out of the gate with Clemson and trip to South Carolina to start the season. Begin the season 2-0, and Georgia could be in great shape to return to the SEC championship game. Last year's injury-plagued season gave several Georgia players a jump-start for 2014. That includes fifth-year senior QB Hutson Mason, who will be surrounded by some of the best skill-position talent in the country, led by RB Todd Gurley. After returning just three starters on D last year, the Bulldogs have 10 guys back who had seven or more starts and return 10 of their top 13 tacklers, led by LB Ramik Wilson. And I think they'll be much improved under former FSU D-coordinator Jeremy Pruitt. In terms of the playoff path, I have the Dawgs favored in every game (four by less than a TD) except the trip to South Carolina. PLUS Weapons on offense. Gurley is easily the best RB in the country, and UGA's top two pass catchers (Chris Conley and Michael Bennett) are back. While I'm hesitant to hype a QB with veteran status but few starts, the word in Athens is that Mason should shine. MINUS Lack of weapons on D. UGA lost talent when DBs Josh Harvey-Clemons, Tray Matthews and Shaq Wiggins either were dismissed or transferred. I'm told Pruitt will be fine without them. But he can't replicate FSU-type success without an SEC-caliber unit. Georgia's chances vs. its toughest foes. Expect plenty of points again, in which case I favor USC's eight returning starters on offense. Even 40 percent feels too high. Does new also mean improved? What's a reasonable expectation from a bunch of freshmen playing in the toughest division in college football? LSU coach Les Miles will be able to answer that question by the end of the season -- because he'll probably have first-time performers all over the field this fall. We're talking about key players at running back (No. 1 overall prospect Leonard Fournette), receivers (Malachi Dupre and Trey Quinn), defensive line (take your pick from a big group of redshirts and true freshmen), safety (Jamal Adams) and the possible starting quarterback (early enrollee Brandon Harris). Talent is definitely not an issue -- the Tigers' 2014 signing class ranked second in ESPN's recruiting rankings -- but a typically demanding SEC West slate, a visit to Florida and an opener against Wisconsin provide little opportunity for the youngsters to develop in a low-pressure environment. LSU returns four starters on the offensive line and has a solid core back from a defense that showed promise toward the end of 2013. But the key factor this season will be whether the many inexperienced Tigers can perform like veterans this season. They're going to contend for championships, but it might not be until 2015 or 2016 if the youngsters experience typical growing pains. In 2013, LSU became the first team in SEC history to boast a 3,000-yard passer, a 1,000-yard rusher and two 1,000-yard receivers in one season. All four are gone. With that turnover, the Tigers will rely on what might be Les Miles' best OL yet (75 career starts) to see them through an always-tough SEC West slate. I peg LSU as an underdog at Auburn, at Florida and against Alabama, but I trust Miles' ability to reload. The Tigers are title contenders in 2014. PLUS Offensive breakout potential. Brace yourselves for Leonard Fournette. The country's top 2014 RB recruit chose the Tigers in January, and ever since, every coach I've talked to brings up one name: Adrian Peterson. He's that good. MINUS Offensive reps. The 19-year-old Fournette and classmates Brandon Harris (No. 2 dual-threat QB) and Malachi Dupre (No. 1 WR) will try to offset LSU's losing 82 percent of its yards. That's hard to make up -- even for blue-chippers. LSU's chances vs. its toughest foes. The Aggies allowed an SEC-worst 32 ppg last year but are favored to beat LSU in the last week of a long 2014 slog through the West? I don't see it. At some places, a 10-win season is just about reason enough to erect a bronze statue of the head coach in front of whatever stadium the team calls home. Then there's USC. For the Trojans, 10-4 reeked of disappointment in 2013 as the team's conference title drought reached five years. Dating back to the formation of the Pac-8 in 1968, USC has only gone more than five years without claiming at least a share of the conference title on one other occasion -- a six-year stretch beginning in 1996. That, of course, was followed by one of the most impressive seven-year runs in college football history as the Trojans finished no lower than No. 4 in the final AP poll from 2002 to 2008. While the Trojans don't appear quite ready to make that same kind of splash -- and have a much tougher conference now to deal with -- they're trending back in that direction under the guidance of first-year coach Steve Sarkisian. With one of the most talented defenses in the country and a revamped, up-tempo offense, the Trojans are contenders in what should be a very competitive Pac-12 South. New coach Steve Sarkisian inherits 14 returning starters from last season's 10-win team. Not bad. I also think the Trojans feature maybe the country's top running back tandem in Tre Madden (5.1 ypc in 2013) and Javorius Allen (5.8 ypc). Sark avoids Pac-12 North foes Oregon and Washington in his first season in L.A., but he can't escape that up-and-comer from the other side of town. I have USC as a road underdog against UCLA (and Stanford). PLUS Stability. No middle-of-the-night firings this year. Sark's program looks to be a few years away, but with the starting QB (Cody Kessler), top RB (Allen) and top WR (Nelson Agholor) back, I could see USC spoiling a Pac-12 title run or two. MINUS Depth. Agholor is key (918 yards, six TDs in '13), but no other returning receiver had more than 300 yards last year. And sophomore SS Su'a Cravens leads a talented but shallow backfield. That's worrisome in this pass-happy conference. USC's chances vs. its toughest foes. All those wishing for a "Brian Kelly offense" after the coach was hired from Cincinnati may finally be getting what they asked for. As Kelly enters Year 5 in South Bend, Indiana, he finally comes armed with a pair of quarterbacks who appear capable of running his attack with the speed and efficiency that many expected after seeing his final Bearcats team put up nearly 40 points per game. One of those quarterbacks, expected starter Everett Golson, helped guide Notre Dame to the national title game as a redshirt freshman. Back after an academic suspension and plenty of work with quarterback guru George Whitfield Jr., Golson enters camp battling with redshirt freshman Malik Zaire, a left-hander who is sure to extend this race to the finish line. The starter will have a handful of weapons at his disposal, with receiver DaVaris Daniels leading a deep but young pool of receivers to go along with three talented running backs. More important, however, is the added responsibility on the offense. Having lost both coordinators to head-coaching jobs, Kelly will resume play-calling duties while college and pro coaching veteran Brian VanGorder takes over a defense that is thin and young up front. For the first time in the Kelly era, the Irish offense will be leading the defense, which, at the very least, should make for some exciting matchups given the names on Notre Dame's schedule. The Irish play my toughest schedule: Michigan and Stanford at home, USC and FSU away. Still, those L.A. and Tallahassee trips are the only games I rank them as clear underdogs. This year Notre Dame is stronger on both sides, starting with Everett Golson, who topped 2,400 passing yards in 2012. Two years later, a matured Golson returns from an academic suspension and could put up the best QB numbers of the Brian Kelly era. PLUS Offensive revival. The Irish grew tired of winning (and losing) 13-10, so Kelly vowed to take over some playcalling. Golson is back 15 pounds heavier and will benefit from depth at skill spots: He told me to watch out for soph RB Greg Bryant. MINUS FSU. Under Kelly, ND is 7-7 vs. ranked squads. But those squads? Not the 2014 Noles. The ND secondary kept big plays in check in '13 (an FBS-low 34 plays of 20-plus yards), but Jameis? Rashad Greene? Welcome to the ACC. Notre Dame's chances vs. its toughest foes. Scholly limits and depth concerns make USC's 77 percent feel bloated. Facing Notre Dame a week after UCLA? Seems like the wrong time to catch the Irish. Ask Dabo Swinney about the program he's built, and he'll quickly note the three straight seasons with at least 10 wins at Clemson, a feat that hadn't been accomplished there since 1990. But ask Swinney about the Tigers' prospects for 2014, and the last thing he's interested in talking about is the past. Tajh Boyd and Sammy Watkins made history at Clemson, but they're gone now, and they've taken the old game plan for winning with them. If the old Tigers were about fireworks on offense, the new group is built around creating chaos on D.
For two years, Clemson worked to live down the embarrassment of a 70-33 Orange Bowl loss to West Virginia, but this season's Tigers' D bears little resemblance to that crew. Vic Beasley leads a group that includes five returning players who had at least 10 tackles for loss last season, and Clemson's defensive front projects as one of the nation's best. The offense will be led by senior Cole Stoudt, but dynamic freshman Deshaun Watson is waiting in the wings. The receiving corps is thin. The line is revamped. The backfield is deep but unproven. It'd be enough to worry most coaches, but Swinney remains ever the optimist. "You lose great players every year, and every team does," Swinney said. "I don't see it as a crossroads or anything like that. Our expectation is to go for our fourth year in a row of 10-plus wins." Gone is Clemson's all-time leading receiver, Sammy Watkins, but the Tigers have a solid replacement in junior Charone Peake, who made eight grabs for 84 yards and a TD before an ACL injury ended his 2013 two games in. Vic Beasley, last year's ACC sack leader (13), is back too, anchoring my No. 2 D-line in the country. But it'll be tough for the Tigers to match the 11 wins from '13. I have them as 'dogs at UGa, at FSU and against South Carolina. PLUS Pressure. I'd put the Tigers' defensive front behind only FSU and Ohio State. It led the country in tackles for loss (123) and may have even more shots at the QB with new cover corner Mackensie Alexander, the No. 4 overall recruit from 2013. MINUS O-line. Clemson must replace Tajh Boyd, but as one coach told me: "I'm not worried about a new QB. I'm worried about who my left and right tackles are." The staff doesn't have faith in the guys protecting likely starter Cole Stoudt. Clemson's chances vs. its toughest foes. The BCS argued computers don't have emotion. But a 12 percent shot at FSU? A win is unlikely, but it sure seems these computers witnessed 2013's bloodbath. Wisconsin has straddled the line between good and great for two decades, collecting Big Ten titles and Rose Bowl appearances but rarely entering the national championship discussion. Melvin Gordon intends to take the Badgers across the threshold. Perhaps more than any other Badger, Gordon, who turned down the NFL for another shot at greatness, understands what a playoff run would mean for the program. "You'll get labeled as one of the elite teams," the running back said. "After all Wisconsin's done, people still don't consider us a high-caliber team. We still get overlooked at times." It's hard to imagine for a program that has eight seasons of nine or more wins since 2004. But without a national title, Wisconsin's ascent won't be complete. The Badgers don't look like a typical contender. They have major questions at quarterback, wide receiver and throughout a defense featuring new faces at new positions. The schedule is favorable following an opening test against LSU in Houston, but second-year coach Gary Andersen must maximize a revamped roster. "You've got to find a way to make those 10-12 special plays that allow you to move from a bad team to a good team," Andersen said, "or a good team to a great team." The Badgers return only three defensive starters from last year, but the inexperienced front seven can learn on the job thanks to a favorable schedule: They avoid Ohio State, Michigan State and Michigan in 2014. I count Wisconsin as a clear underdog in only its season opener, against LSU, with toss-ups on trips to Northwestern and Iowa. But even those two in-conference bouts shouldn't scare Wisconsin. The Badgers beat them 63-15 combined in 2013. PLUS RBs. Heard of Melvin Gordon? You'll hear of Corey Clement too. Like last year, UW will have a two-headed backfield. With four starters back on the Big Ten's best O-line, the run game will return to its '13 form (283.8 ypg, No. 2 in the Big Ten). MINUS Defensive turnover. Physical D at the line of scrimmage is a Wisconsin calling card, but only one starter returns to the front seven. And LB Chris Borland is gone, taking his 420 career tackles, 50 TFL and 17 sacks with him. That's a huge hole. Wisconsin's chances vs. its toughest foes. UW catches a green LSU offense at the right time (read: early). If the Badgers win time of possession, they can take this game. I put the odds at 50-50. Much of the discussion surrounding Texas A&M heading into 2014 involves players who won't be suiting up for the Aggies this fall. Everyone's curious what life after Johnny Manziel, Mike Evans and Jake Matthews will resemble. The Aggies should be fine offensively because, even with the loss of three NFL first-round draft picks, they have plenty of talent, from four returning starters along the offensive line, three returning scholarship running backs who each had carries last year and a young, talented receiving corps. The only real question offensively is who will be calling the signals on Aug. 28 -- sophomore Kenny Hill or true freshman Kyle Allen. Where the Aggies must improve is on defense, where the team was downright poor last season. The cause isn't helped by the fact that three would-be returning starters have either been dismissed or left the team. What was a young defense is still very much that and the effort to build quality SEC depth is ongoing. The Aggies can score, but can they keep opponents from lighting up the scoreboard? After the Aggies stockpiled 20 wins in their first two years in the SEC, life after Manziel might prove more difficult. I think true frosh Kyle Allen will get the nod, but I don't see how he can be anywhere near as impactful as Johnny Football. Even with expected improvement on D (the Aggies return 77.5 percent of their tackles, No. 24 in the country), I list them as underdogs in four tough road dates: South Carolina, Mississippi State, Alabama and Auburn. PLUS NFL talent. The No. 7 overall prep from '14, receiver Speedy Noil, looks like Tavon Austin. Ricky Seals-Jones, a redshirt frosh also at WR, has Megatron potential. And senior Cedric Ogbuehi could be a third straight first-rounder at LT. MINUS Defense. This unit returns six starters, but it gave up 6.4 yards per play, last in the SEC. I've heard Will Muschamp's name mentioned if DC Mark Snyder can't turn the D around -- and Muschamp can't turn Florida around. Texas A&M's chances vs. its toughest foes. Bad news, Aggies: Manziel now calls Cleveland home. 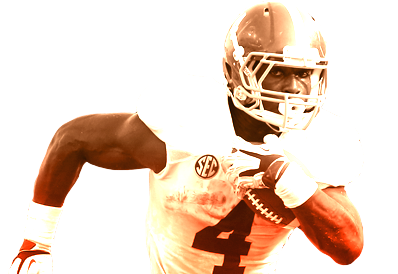 After a loss and scare the past two years, Bama will roll. A&M's 30 percent chance? Generous. If the Rebels are going to really take the next step under Hugh Freeze, they have to beat one of the big boys. Fifteen wins, including two bowl victories, have certainly been applauded, but more is now expected from Ole Miss. Freeze is just 2-7 against Top 25 teams. Getting West contenders Alabama, Auburn and Mississippi State at home should help, but it'll take more than home-field advantage to send the Rebels to Atlanta. Even with depth issues, Ole Miss has a solid foundation on both sides of the ball and should get even more out of that historic 2013 class. The defense could be fun to watch, especially the defensive line. Former No. 1 recruit Robert Nkemdiche is moving to tackle, where he's excelled so far. But the key will be getting to the quarterback, and the return of defensive end C.J. Johnson should really boost this defense after a leg injury cut his 2013 season short. Quarterback Bo Wallace, whose inconsistency has hurt Ole Miss in the past, could be the X factor. Despite an up-and-down career, things could be different this season, as Wallace has finally gotten over a shoulder injury that has plagued him for two years and is throwing with much more confidence. The Rebels welcome back QB Bo Wallace (3,346 passing yards in 2013) and their top two rushers, I'Tavius Mathers and Jaylen Walton (1,086 yards combined). Even better? What they don't have: South Carolina, Georgia or Florida on the 2014 docket. Since they avoid the East's Big Three, I have the Rebels as clear underdogs against only the West's Big Two, LSU and Bama. Even so, Ole Miss is close talent-wise to the Tigers and Tide and could take a surprise turn to the SEC title game. PLUS Sophs. WR Laquon Treadwell, with 72 grabs for 608 yards, merits first-team All-SEC talk. LT Laremy Tunsil gave up one sack all year. And 2013's top overall prep, DT Robert Nkemdiche, is a likely first-rounder. The Rebs go as these guys go. MINUS Depth. Talent in the starting lineup is one thing. Two deep at every spot? Another. The Rebels don't have the layers that Bama, Auburn and LSU do. Sorry, Coach Freeze, one top-10 recruiting class every five years won't cut it. Ole Miss' chances vs. its toughest foes. The Rebels' D returns nine and will be stingy against rookie QBs like A&M's Kyle Allen. The computers don't account for Manziel's loss enough -- Ole Miss should be favored. Chris Petersen excelled at Boise State but there was always a but whenever anyone talked about his success. Now in a power conference, he's going to have the eyes of the country on him as he takes his first steps. So, what will his freshman year in the Pac-12 look like? Offensively, he'll need to find replacements for quarterback Keith Price (2,966 passing yards, 21 passing touchdowns), running back Bishop Sankey (1,870 rushing yards, 20 rushing touchdowns) and tight end Austin Seferian-Jenkins (450 receiving yards, eight touchdowns). But there's talent in the wings. Petersen reinstated QB Cyler Miles after spring ball and wide receiver Jaydon Mickens is looking to improve on his 688-yard, five-touchdown 2013 season. The Huskies have options at running back -- Dwayne Washington, Jesse Callier and Deontae Cooper are all names that could come up. Defensively, the Huskies are in pretty good shape. Up front they return tackle Danny Shelton as well as Evan Hudson and Hau'oli Kikaha. Linebacker Shaq Thompson -- who could play both ways for the Huskies this fall -- is going to be a playmaker. And in the secondary, Washington will rely on its only returning starter, cornerback Marcus Peters, who had five interceptions in 2013. Chris Petersen did more with less at Boise State. So although the Huskies lose three-year starting QB Keith Price and All-America RB Bishop Sankey (who both own UW career TD records with 75 and 37, respectively), Petersen won't have to work as hard in Seattle. The Huskies have 124 career starts on an O-line I rank ninth in the country. I count UW as a clear underdog just twice: at Oregon and against UCLA, with the Stanford and Arizona tilts as toss-ups. PLUS Petersen. He's the only reason U-Dub jumps into the Top 25. His team might be a couple of years away in a really strong Pac-12 North, but six returning starters on the defensive front seven is a nice backbone for Year 1. MINUS Offense. The Huskies return 34 percent of their yards; only Arizona has lost more in the Pac-12. No knock on sophs QB Cyler Miles and RB Dwayne Washington, but I just don't think they can fill that Price-Sankey crater right away. Washington's chances vs. its toughest foes. With upward of four Huskies defenders who could be drafted next spring, UCLA's visit should be a tight game. I'd put the odds closer to 50-50 than 70-30. How does a team with questions at quarterback, offensive line and across the defense get so much preseason love? Because the way it ended 2013 has made this team irresistible to overlook. How could you not love the grit and perseverance of a team that overcame a 1-5 start to win its bowl game in impressive fashion? Most of the players who were so key to that turnaround are back. While Larry Fedora has not named a starter at quarterback, Marquise Williams returns after putting the team on his shoulders and carrying it to the Belk Bowl. Mitch Trubisky, in competition to take the starting job, has been called the perfect fit for the "Fed Spread." Either way, the Tar Heels should be in great shape. The depth at running back is tantalizing, with Romar Morris, T.J. Logan and Khris Francis returning, along with the addition of ESPN 300 back Elijah Hood (once a Notre Dame commit). Quinshad Davis, T.J. Thorpe and Ryan Switzer make a talented trio at receiver. Talent is everywhere at the skill positions. And while there may be some questions defensively, Norkeithus Otis has emerged as one of the best linebackers in the ACC, and there is young talent and plenty of depth on the defensive line. If North Carolina can settle its issues on the offensive line, there is no doubt this can be a team on the rise. The Tar Heels started 3-5 last year. Then quarterback Marquise Williams grabbed the reins and jolted them to a 4-1 finish. The junior isn't the only playmaker who's back: All-America return man Ryan Switzer (five punt-return TDs, most in the country), 14 starters and seven of the team's top 10 tacklers also return. I rank the Heels' schedule as the 27th toughest, but I still have them as underdogs in only three games: at Clemson, at Notre Dame and at Miami. PLUS Rushing depth. T.J. Logan led all UNC RBs with 533 yards last year despite missing the first four games. Now in the mix will be Elijah Hood, the Heels' highest-ranked '14 recruit, who's already turning heads: He squatted 605 pounds in July. MINUS Lack of NFL-caliber talent. With the loss of TE Eric Ebron to the 2014 draft, I spot just one early-rounder on the roster: WR Quinshad Davis. UNC's pedigree just doesn't match that of Clemson, Notre Dame or Miami right now. North Carolina's chances vs. its toughest foes. UNC should be 3-0, while Clemson will be coming off road trips to UGA and FSU. I think Clemson wins, but it's more intriguing than these odds suggest. Bo Pelini insists it was a minor change. Nebraska's seventh-year coach simply shed one layer of his shell, he said. Pelini allowed a glimpse of the real Bo after last season, when his job appeared in jeopardy despite a sixth straight season with nine or more victories. "The perception that people had of me and the reality," Pelini said recently, "I've always kind of laughed." Reality or just perception, the difference since December looks significant. Pelini, noted for his brusque exterior, has shown a playful side in public. He smiles. He's pleasant, approachable, though still largely private away from the game. Pelini said his friends and family, players and staff have long known this side of him. "I've always had fun," he said. The lighter side of Pelini remained on display into August as the Huskers opened preseason practice. But will it impact the team? The short answer: Yes. If the Huskers see their coach enjoying himself more in public, they're likely to follow suit on game days. With a young team led by a new full-time starting quarterback, Nebraska stands to benefit from a more relaxed environment. This year more than ever, it starts at the top with Bo. Bo Pelini has won at least nine games in each of his six seasons in Lincoln. He's also lost exactly four times each season. For 2014, I count the Huskers as underdogs in -- surprise -- four contests: road games against Michigan State, Northwestern, Wisconsin and Iowa. Still, the line for each is a touchdown or less, and here's a stat worth noting: The Huskers have won nine straight games decided by that margin, most in the country. PLUS Ameer Abdullah. Whether Tommy Armstrong Jr. or redshirt frosh Johnny Stanton (who could jump-start this program) wins the QB job, Abdullah is a 250-carry RB. And if he averages 130 ypg again, he'll take pressure off whichever QB hands off to him. MINUS Big-game whiffs. In 2012, the Huskers were blown out by 39 points in the Big Ten title game. In the '13 regular season, they lost to both of their ranked opponents by 33 combined. The notion that they'd join the Big Ten and dominate hasn't come true. Nebraska's chances vs. its toughest foes. Nebraska put up 28 against MSU at home in '13, but with a rebuilt O-line and five new starters on D, 31 percent is generous. Credit to George O'Leary for taking a program that went 0-11 in 2004 and guiding it to six bowl games in the last nine seasons. Tucked away in the American, he's built a niche in the state of Florida, drawing in talent that Florida, FSU and Miami passed over. 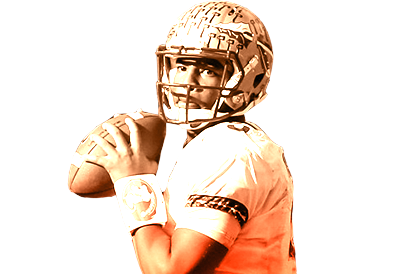 No player more exemplified that diamond-in-the-rough recruiting than Blake Bortles, who transformed into a first-round pick at QB and helped the Knights to double-digit wins the last two seasons. The high-water mark, of course, came in January when UCF ventured into its first BCS bowl, beating Baylor in the Fiesta. The question now is whether that level of success is sustainable with Bortles and star running back Storm Johnson gone. Plenty of once-overlooked talent remains for O'Leary to compete with in the the American, but even with six returning starters on offense, navigating a schedule that features Penn State, Missouri and BYU could prove difficult. The good news is UCF's top three receivers, both of its specialists and nine starters on defense are back. And after hearing all offseason what they've lost, you better believe they'll come out this season ready to prove 2013 was no fluke. Given the program's history of recruiting kids with chips on their shoulders, it is a hard bunch to bet against. It's always a blow to lose a player like QB Blake Bortles, the No. 3 pick in the draft, but the Knights return 15 starters, nine on the AAC's best defense. It's true that UCF caught a few breaks in 2013 (seven wins by a TD or less), but I think the Knights have a shot at running the AAC table for the second straight year. I rate them as underdogs in just two games (at Missouri and at Houston), with the opener in Ireland against Penn State pegged a toss-up. PLUS The secondary. This unit returns its entire two-deep, including first-team AAC CB Jacoby Glenn, who racked up two INTs, 15 pass breakups and 52 tackles last year. For 2014, UCF adds four-star prep SS Kyle Gibson, who could see early snaps. MINUS The AAC. You can't ignore the fact that UCF is the only non-Power Five team to crack the Top 25 (save for Notre Dame). Will the committee really be looking at the Knights as playoff contenders, even if they beat Penn State and Missouri? UCF's chances vs. its toughest foes. Six of the Knights' top seven tacklers return to a D that stifled Houston's spread in 2013. UCF deserves better than 1-in-3. Charlie Strong has neatly sorted his first year at Texas into five phases. He hired a staff and oversaw winter conditioning during Phase 1. He lost starting quarterback David Ash to a foot injury and was missing a dozen other Longhorns during the second phase, spring ball. Strong got Ash back at the end of Phase 3 (summer conditioning) but also dismissed five players and suspended three more. The discipline sent a clear message: Buy in or get out. Are you ready to buy into this Texas team? Entering the fall practice stage, even the new head coach is hesitant. "I said, after looking at Phase 2, we're not going to compete for a championship. We had a lot of work to do," Strong said. For all the uncertainty, Strong also inherits proven talent. He has the Big 12's best rushing duo in Johnathan Gray and Malcolm Brown, a potentially elite defensive line featuring DE Cedric Reed and DT Malcom Brown and a two-deep loaded with upperclassmen. The schedule isn't friendly --- Texas gets UCLA, Baylor and Oklahoma in the first half of Phase 5 --- and rebuilding isn't over. Strong hasn't promised much, just a stout defense and a tougher football team. If he can produce that in Year 1, the Longhorns' recent underachievement might seem like just another passing phase. The Longhorns have underachieved in each of the past four years. Enter Charlie Strong. The new coach inherits 14 returning starters and a top-10 defense, so even with a rash of July dismissals, he'll have plenty to work with. Strong says Texas isn't a national contender yet, but I do think it will compete for a Big 12 title. I have the Longhorns as clear underdogs in just two games (UCLA, OU), with three others as toss-ups. PLUS Strong. His public persona may need some work, but his coaching doesn't. Strong is quickly instilling his own brand of discipline in the Longhorns. As of July 28, he had kicked at least six players off the team and suspended another two indefinitely. MINUS Offensive talent. RB Malcolm Brown will get yards (904 in '13), but QB David Ash is a question mark. 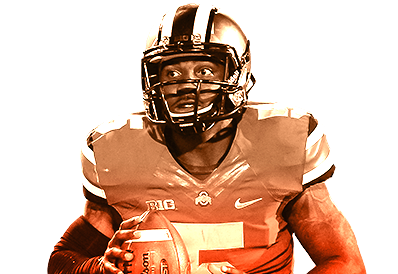 And even if soph Tyrone Swoopes plays, Strong can't turn him into Teddy Bridgewater right away. It's a vanilla pro-style until Strong recruits his own guys. Texas' chances vs. its toughest foes. OU is a trendy Big 12 pick, and UT will sputter at scoring points, but the Sooners' 3-in-4 shot in a rivalry game is an overreach. Gary Patterson uses an interesting but bizarre analogy to explain why he completely revamped his offense this offseason. "I like Gatorade," he said. "When you have to beat people 17-13 just drinking water, you'd like to be able to go back and find out what the different Gatorades are." To clarify, Patterson had grown tired of relying exclusively on his defense to win in the Big 12. And instead of trying to slug out more low-scoring affairs, he wanted his offense to produce some routs -- to afford him time to walk behind the bench and sample different Gatorade flavors. The Horned Frogs actually had a chance to win every game but one last season. But with a stone-age offense unable to score in the fourth quarter, TCU missed a bowl for the first time since 2004. In turn, Patterson brought in coordinators Doug Meacham and Sonny Cumbie to install a modern, up-tempo attack. He also snagged Texas A&M transfer quarterback Matt Joeckel, who knows how to operate such an offense. Despite losing Devonte Fields, the preseason Big 12 Defensive Player of the Year who was suspended over the summer after charges of assaulting an ex-girlfriend, TCU should still be stout again on defense, with seven other starters back. But how the offensive changes pan out will ultimately determine whether Patterson will be drinking water again. Or, as he hopes, Gatorade. TCU is my most improved team in the country, even without Devonte Fields, the Big 12's preseason Defensive POY, who was "separated" from the Horned Frogs in July due to an ongoing assault investigation. The Frogs get 15 starters back and were better than their 4-8 record last year, losing four games by three points or fewer. I think TCU can reach double-digit wins in '14, and I see it as a 'dog against OU, at Baylor and at UT, but by a TD or less in each. PLUS Gary Patterson defenses. The unit fell off in 2013 (25.3 ppg, the most allowed in the past nine years), but key returns like strong safety Sam Carter (four sacks, five picks) make me think those three-point losses might swing the other way this year. MINUS Gary Patterson QBs. The coach has not gotten much from his passers lately. He hopes Texas A&M transfer Matt Joeckel can turn around an O that ranked 103rd in yards per play (5.0) in '13, but it's a lot to expect from a QB with just 27 career completions. TCU's chances vs. its toughest foes. After playing Bama, OU, Texas Tech, Baylor and Oklahoma State, WVU might be battered by November. Even 55 percent feels too low for TCU.